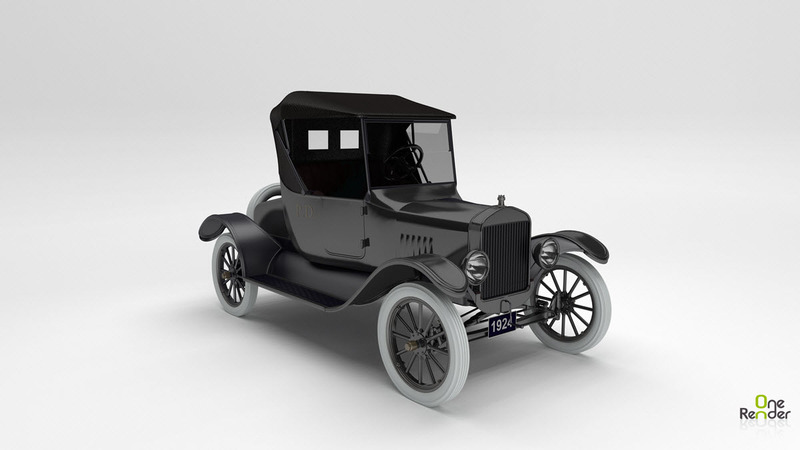 Here is a first render of our 1924 Model T Runabout model rendered on OneRender.This is model 2 of 8 of the American Cars in the 1920s series of models. It is available for 3DS MAX, Poser / DAZ Studio, Shade 3D, Vue 3D, Bryce and Blender. The Model T Runabout wasn’t as durable as the Model T Center Door, but it was less expensive and fully capable of modest distance driving. This version is based on a version that shipped in 1924, and features a removable canvas roof. The model was first designed in 3D Studio MAX, then imported into OneRender. I updated the textures using some slightly modified versions of OneRender custom shaders. I have a few more tweaks I want to do but this is looking good so far.